As a Wedding Photographer for Quechee Inn events, I have experienced many lovely occasions. A Wedding Photographer for Quechee Inn at Marshland Farms is able to capture images the show both the natural beauty of Vermont, as well as the little details that make a wedding incredibly special. This photograph focuses on the latter, displaying the party favors made for the wedding guests by the bride and groom. Party favors, or sentimental tokens from a wedding that guests may take home with them, often can become a source of concern for couples as they plan for their big day. Couples sometimes struggle with deciding on appropriate favors, and they try to think of a token that will be useful for guests and will also remind them of the fond memories they made on that day. This couple, Hannah and Josh, chose to give guests a small matchbook, among other tokens. 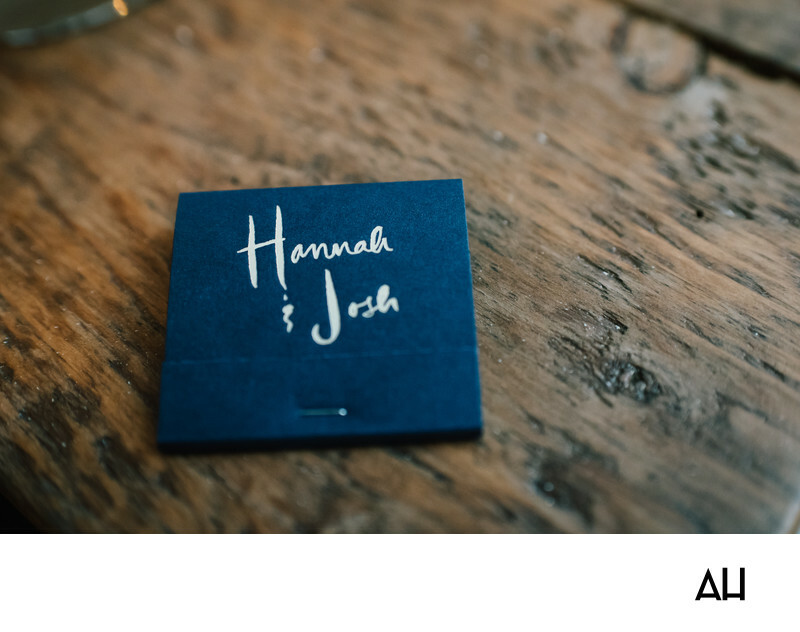 The matchbook is navy, with the names of the bride and groom engraved on its surface in white script. The matchbook is a practical favor, with sentimental ties. Family and friends who attend the wedding reception will most likely return home and toss the matchbook in a drawer that holds odds and ends. Each time a match is needed though, the little book will be taken out and guests will be reminded of this blessed day. Every time a match from the book is lit, the spark that is created will flare up as a symbol of the warmth that permeated this day full of friendship, love, and blissful celebration.